These water features are must-sees in these amazing destinations. France recently revealed the crystal fountains situated between the Arc de Triomphe and the Place de la Concorde. Here’s a look at six of the world’s most impressive and must-see fountains. Six new crystal fountains on the French capital’s Avenue des Champs-Elysées were officially inaugurated on 21 March. The structures – made from an alloy of bronze and aluminum, as well as crystal, and lit up at night – are likely to become a new tourist attraction on the world’s most famous avenue. According to Architecture Digest, the new fountains are technological wizardry in motion as none of the inner workings are visible from the exterior. The designers, Ronan and Erwan Bouroulle, who are brothers, collaborated closely with Swarovski, with whom they have worked before, and ended up with a new type of crystal designed to be shock resistant, water friendly, light reflective, and able to withstand extreme weather conditions. 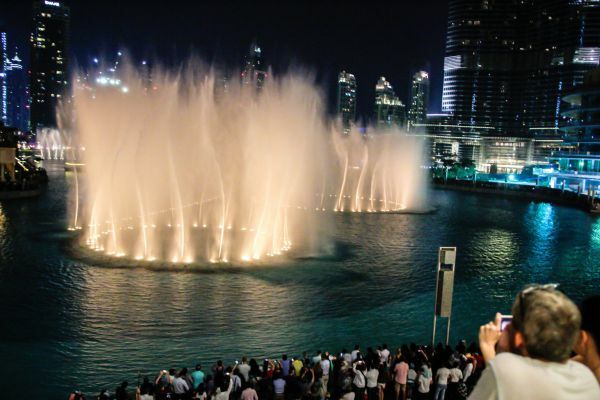 Installed on the manmade Burj Khalifa Lake – bearing the same name as the world’s tallest skyscraper, standing 828 meters tall – the Dubai Fountain is a dancing water show that’s popular with visitors. Free of charge and running every 20 minutes throughout the week and at weekends, the show features water jets dancing to a soundtrack. The structure is equipped with 25 colored light projectors, giving the fountain a magical feel. It was designed by the same firm behind the fountains at the Bellagio Hotel in Las Vegas. 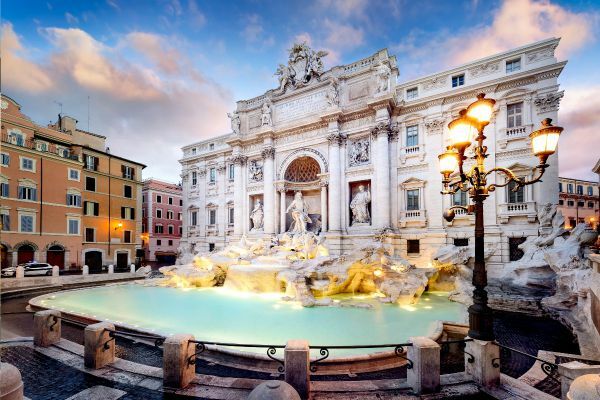 The Trevi Fountain is synonymous with Rome. Made famous when Anita Ekberg waded into its waters in Federico Fellini’s 1960 movie, La Dolce Vita, visitors flock to this Roman monument to throw in a coin with their right hand over the left shoulder with their back to the fountain. Legend has it that tourists who do this will be sure to return to the Eternal City in the future. 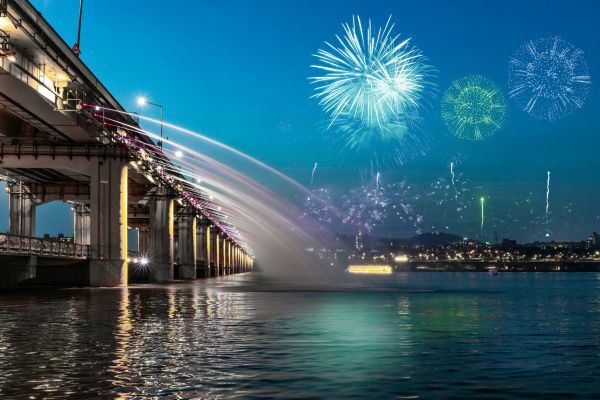 In the South Korean capital, the Banpo Bridge was built on top of Jamsu Bridge, allowing people to cross from one bank to the other even when water levels are high. This double-decker bridge dating from the 1980s has become a tourist attraction, notably thanks to its Rainbow Fountain. Jets of water span the length of the bridge and spray water down into the river below from both sides. The installation is equipped with colored lights that bring rainbow effects to the show. 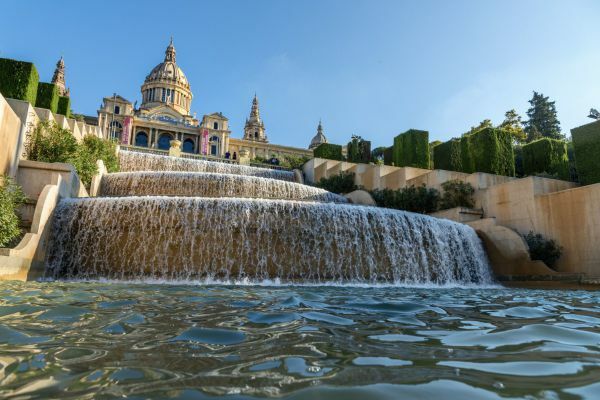 In the southwest of the city, in the Montjuïc neighborhood, the Magic Fountain – designed by the architect Carles Buïgas – enchants visitors with its playful water jets and sound and light effects. The fountain was built for the 1929 Barcelona International Exhibition and its popularity was boosted when it was renovated for the city’s 1992 Olympics. 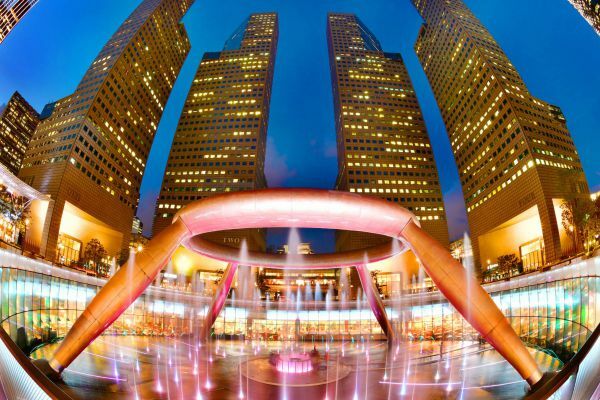 Listed as the world’s largest fountain in the late 1990s, this structure is located in the heart of the city-state, opposite the Suntec City shopping mall. Like its global counterparts, this fountain is equipped with lights to wow passersby with rainbow colors. The fountain’s ring structure is based on the Hindu Mandala, a ritual symbol meaning universe, underlining the importance of equality and harmony of all races and religions in Singapore.